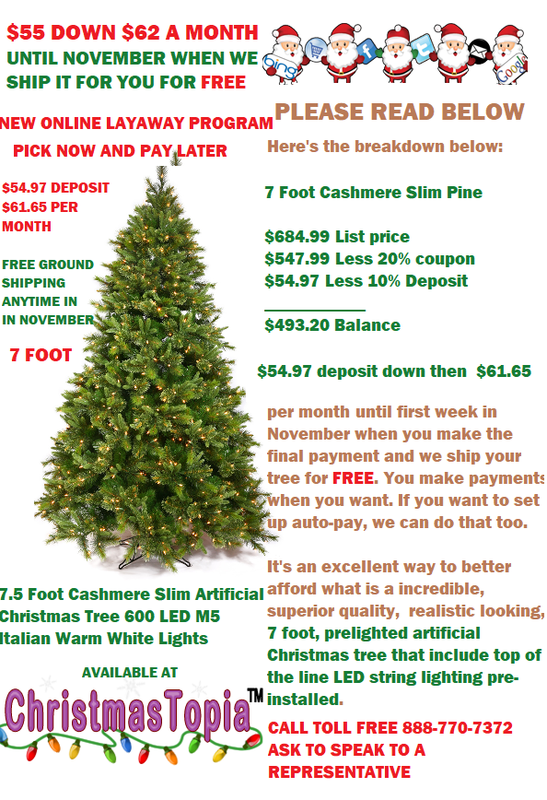 $54.97 deposit down then $61.65 per month‎ until first week in November when you make the final payment and we ship your tree for FREE.‎ You make payments when you want. If you want to set up auto-pay, we can do that too. This is one gorgeous Christmas tree and you can easily own it to be exact for $54.97 down and $61.65 per month. If there are some months where you cannot make a payment, it’s no problem. The entire transaction process is completely automated and secure. You pay when you can pay. When you have the $$$ you can make a payment. The payment service is provided by Paypal so you know all transactions are secure. If you like this particular Christmas tree and the layaway opportunity in this post, to get it just follow the layaway instructions ‎and start your own layaway today. Team Santa Inc. has opened their layaway program to almost all of the product selection. Once you leave a deposit, the product that your purchasing is put away especially for you. You don’t have to worry about us selling out, or any other problems that might arise. With Team Santa Inc. layaway program, you can pay off your order without interest and then have it shipped to your location when it is convenient for you to receive it. That’s all there is to it.